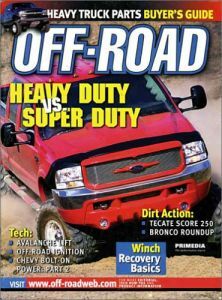 Off Road Magazine emphasises modifications of light truck and 4 Wheel Drive vehicles for off highway action. Each issue of Off Road Magazine provides tech tips, product reviews and custom features , technical knowledge and details on how to create a high performance truck engine and suspension buildups as well as step-by-step component bolt-ons as well as off-road events. Off Road Magazine gives you everything you need to take your ride off the beaten path.